Foreign Minister Augustine Kpehe Ngafuan has extolled President Ellen Johnson Sirleaf for constituting the National Committee on International Humanitarian Law of Liberia, calling on the Committee to diligently and conscientiously work in the interest of the Liberian people. Minister Ngafuan spoke on Friday July 12, 2013 when he officially launched the National Committee of the International Humanitarian Law of Liberia on behalf of Vice President Joseph N. Boakai at the National Museum of Liberia. Making remarks at the launching ceremony, Minister Ngafuan stressed the significance of the Humanitarian law and its consequences on war-affected nations, adding, “The best way to prevent war is to avoid going to war”. 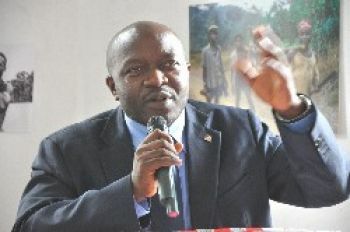 The Liberian Foreign Minister asserted that President Johnson Sirleaf, knowing the importance of humanitarian law, has committed herself to maintaining peace and stability in the Mano River Union basin with a promise never to allow any of Liberia’s territories to be used to destabilize any of her neighboring countries. Members of the newly constituted National Committee of the International Humanitarian Law include the Ministry of Foreign Affairs, Chair, Ministry of Justice, Co-Chair, and the Law Reform Commission, Co-Chair. Other members of the committee are the Ministries of Education, Defense, Information, Cultural Affairs and Tourism, the Independence National Commission on Human Rights, Foundation for Democracy in Liberia and the Liberia National Police. The mandate of the National Committee is to promote the ratification of and adherence to Humanitarian Law Treaties, and the amendment of National Legislation in compliance with these treaties, as well as to contribute to the dissemination of humanitarian law. The Committee is also responsible to draw up advisory opinions on the Republic’s position on problem of humanitarian law, draft treaties, and nation implementation legislation and to monitor the application of rules of humanitarian law at the national level as well as to cooperate and exchange information with the ICRC and other international organizations involved in the implementation of humanitarian laws.